So you already have some perfectly good reasons to learn German … Maybe you want to be able to communicate with relatives, or to travel to Germany during your summer break, or prepare yourself for study in a German-speaking country. Maybe a German exchange student sparked your interest, or you have a friend who recommended it, or you just like the way the language sounds. Just in case you need some reassurance in your decision or the final push toward taking the plunge, here are 12 more solid reasons why learning German may be a good choice for you. 1. German is the most widely spoken language in Europe. More people speak German as their native language than any other language in Europe. It’s no wonder, since Germany’s 81 million inhabitants make it the most populous European nation. But not only the residents of Germany speak German. It is also an official language of Austria, Switzerland, Luxembourg, and Liechtenstein. And it is the native language of a significant portion of the population in northern Italy, eastern Belgium, the Netherlands, Denmark, eastern France, parts of Poland, the Czech Republic, Russia, and Romania, as well as in other parts of Europe. While learning German can connect you to 100 million native German speakers around the globe, remember that many people also learn German as a second language. 2. Germany has the 4th largest economy and is the #1 export nation in the world. Germany has the fourth largest economy in the world (GDP $4 trillion) and is the economic powerhouse of the European Union. In 2013 — for the 12th year in a row and depite the strength of the euro currency — the Germans were world champions in exports (1). In 2013, Germany exported 1.5 trillion US dollars worth of goods and services and accounting for nearly 70% of the European Union’s total exports.From cars to machinery and industrial equipment, from pharmaceuticals to household goods, German businesses earn 1 in 3 euros through export, and 1 in 4 jobs depends on exports. The competetiveness and desirability of German products on the market are indicated by the country’s substantial trade surplus, which reached nearly 200 billion euros (263 billion dollars) in 2013 and continues to grow every year. And don’t forget that Switzerland, another German-speaking country, has one of the highest standards of living in the world. Switzerland’s economy was ranked 1st in the World Economic Forum’s Global Competitiveness Report 2013/2014. 3. Knowing German creates business opportunities. Germany’s economic strength equals business opportunities. Multinational businesses exist throughout the European Union and in the Eastern European countries, where German is the second most spoken language after Russian. Companies like BMW, Daimler, Siemens, Lufthansa, SAP, Bosch, Infineon, BASF, and many others need international partners. The Japanese, who have the 5th most powerful economy in the world, understand the business advantages that a knowledge of German will bring them: 68% of Japanese students study German. If you’re looking for employment in the United States, knowing German can give you great advantages. The German-American Chamber of Commerce lists 3,700 German companies doing business in the United States. German companies account for more than half a million jobs in the U.S. (2), and American companies have created approximately 800.000 jobs in Germany (3). All other things being equal, the job candidate with German skills will trump the one without such skills every time. Most surveyed companies in the United States would choose someone with German literacy over an equally qualified candidate. 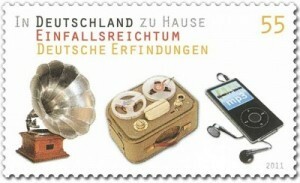 From Gutenberg’s printing press to Hertz’s discovery of electromagnetic waves, from Ehrlich’s development of chemotherapy to Einstein’s theory of relativity, to Brandenburg’s creation of the MP3 digital music format, throughout history Germans have proven themselves time and again to be great innovators. That trend continues today. In annual patent applications, Germany ranks 5th in the world, and the number of applications is rising annually. When patent applications are measured per capita, Switzerland, Germany, and Austria are all within the top 10 countries internationally (4). As a nation committed to research and development, Germans are on the frontline of new technologies. Germany exports more high-tech products than any other country except China, and more than 750 firms are active in the cutting-edge field of biotechnology (5). More than 200 of these are located in Munich alone. The east German state of Saxony has become Europe’s microchip center with its more than 2,100 companies that support the development , manufacturing, and distribution of integrated circuits, microchips, and software (6). 5. Germans are the biggest spenders of tourist dollars in the world. While German workers are highly productive, it is clear that they know how to play just as hard as they work. With ample disposable income and an average of 6 weeks of vacation a year, Germans have the time and the means to travel, … and they do! If you are a world traveler, you are certain to encounter Germans wherever you go since nearly 3 out of every 4 vacations by Germans are spent in other countries, making them the champions of world travel. In 2013, they spent a whopping 65 billion euros on international travel (7). Year after year, the residents of Germany spend more on foreign travel than those of any other nation. Germans especially favor travel to warm Mediterranean climates, such as can be found in Spain, Italy, Turkey, and Greece, and travel to Eastern European countries is also popular. Germans also readily travel to Africa, the Far East, and the Americas. 1.9 million German tourists visited the U.S. in 2013, making Germans the fourth largest nationality of tourists to the United States (after the British, Japanese, and Brazilians). The most popular U.S. destinations are California, Florida, and New York. Travel agencies, tour companies, hotels, airlines, and car rental agencies that can communicate with Germans in their own language will win their business. Floridians know this: In that state there are at least two travel magazines published in German: Florida Journal and Florida Sun Magazin. 6. The German presence on the Internet supercedes most others. Considering what great innovators the Germans are, it’s not at all surprising that they maintain a dominant Internet presence. German is the 2nd most common language of webpages on the Internet. With more than 15 million Internet domains, Germany’s top-level country domain .de is second only to the extension .com. That makes German domain names even more popular than those with .net, .org, .info, and .biz extensions. Even the second-place country extension .uk trails far behind at 10 million domain names (8). 7. Germans form the largest single heritage group in the U.S. 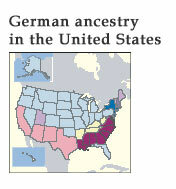 The light blue areas on the map represent the states in which German ancestry ranks ahead of all other ethnic groups. See the county-by-county breakdown to see a more detailed distribution. If you’re American or are interested in American culture, learning German can expand your appreciation and knowledge of U.S. history and culture. In the year 2010 census, 49.8 million or more than 16% of Americans reported having German ancestry, making German Americans the largest single heritage group in the U.S. More than half of the nation’s 3,143 counties contain a plurality of people who describe themselves as German-American. In waves of immigration that span nearly 4 centuries, Germans brought with them many customs and traditions that have become so ingrained in American ways that their origin is often forgotten. Family names and names of thousands of towns and cities indicate the German heritage of their ancestors or founders. Such cultural mainstays as kindergarten, the Christmas tree, and hot dogs and hamburgers were introduced by German immigrants to America. They founded multiple breweries, created Levi’s jeans, invented ketchup, and created Hershey’s chocolate. Germans had such a fundamental presence at the time of the founding of the United States that a German language version of the Declaration of Independence was printed only a few days after it was adopted. German is not only a language of the past. As prolific researchers and scholars, German speakers produce more than 80,000 new book titles each year. The only language markets that produce more books annually are the Chinese and English publishing industries. In number of books published, Munich is second in the world only to New York. Since only a small percentage of German books are translated into other languages (for instance, approximately 10% into Korean and Chinese, just over 5% into English), only a knowledge of German will give you access to a vast majority of these titles. 9. German-speaking countries have a rich cultural heritage. Johann Wolfgang von Goethe, Thomas Mann, Franz Kafka, and Hermann Hesse are just a few authors whose names and works are well-known internationally. 13 Nobel prizes for literature have been awarded to German-speaking authors. The world of classical music is inseparable from the names of Mozart, Bach, Beethoven, Strauss, and Wagner to name only a few reknowned German-speaking composers. Vienna remains an international center of music today. From the magnificent architecture of medieval buildings to the avant garde Bauhaus movement, from Dürer’s woodcuts to the expressionist masterpieces of Nolde, Kirchner, and Kokoschka, Germans have made substantial contributions to world art and architecture. Philosophy and the sciences would also be unthinkable without the contributions of German speakers. The philosophies of Kant, Hegel, Marx, Nietzsche, and numerous others have had lasting influences on modern society. The psychologists Freud and Jung forever changed the way we think about human behavior. Scientists from the three major German-speaking countries have won dozens of Nobel prizes in physics, chemistry, and medicine. 10. German is not as hard as you think. Meine Schwester hat braunes Haar. Sie studiert Medizin in Berlin. … then you already know some German! In addition, German is spelled phonetically. Once you learn the system of sounds, it is easy to predict how the spoken word is written and how the written word is pronounced. 11. German is required or recommended by many undergraduate and graduate programs. German speakers’ strong contributions in such a broad array of fields makes the language an important asset in many disciplines. At the University of California, for instance, more majors recommend a knowledge of German as an important supplement than any other language (German: 56 majors, French: 43 majors, Spanish: 21 majors, Japanese: 7 majors). These majors include a wide range of subjects — from biology, physics, and chemistry to linguistics, religious studies, and art history. Considering the importance of the German language in the fields of publishing and research, it’s not surprising that many graduate schools want their graduates to have at least a reading knowledge of German. Knowing German gives graduates access to important research published in German books and professional journals. 12. Germany financially sponsors over 75,000 international exchanges each year. While promoting innovation and supporting research within Germany, the Germans also recognize that international cooperation and experience is essential to its continued success as a world leader. In the year 2012 alone, the German Academic Exchange Service (DAAD) supported more than 75,000 scholars, scientists, educators, and students in periods of international research and study. 60% of these were foreigners who were awarded financial assistance to participate in an exchange in Germany. (9) In addition, like German students, foreign students directly enrolled in German universities pay no tuition fees. Adapted with permission from © vistawide.com – Why learn German? Having met many Germans almost daily in my work in the satellite business, I can certainly say knowing a little language, even just a few phrases and having a working knowledge of the German tv business has worked very well for me, earning me new business and repeat business over the last few years. Those word of mouth recommendations are what every business should generate, its worth ten times as much as new business by advertising. Probably more than any other European nation, the Germans appreciate things that are, up to date and fully featured. They do, as your article states usually have a good disposable income, so offer them the best and use good standards in your work and you can’t go wrong. Another thing that has become more noticeable in Electronics is that German made or designed goods ( much like their cars ) sell better and most last longer than the usual Chinese products. Face it are you going to get recommendations from someone who bought a new gadget which only lasted 6 months, or one that is going strong 5 years later? I hope to learn German very sono. Belgien fehlt in der Liste der Länder, deren offizielle Landessprache Deutsch ist!